Wild Champions Scratch Card Guide & Review - Casino Answers! 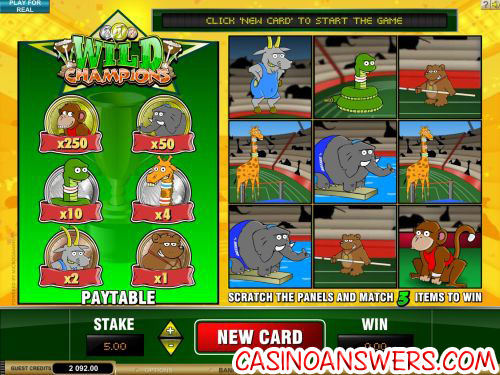 Wild Champions is an instant win online scratch card game from Microgaming. You can win up to 250 times your bet playing the Wild Champions scratch card. You can find Wild Champions at 777 Dragon Casino and King Neptunes Casino. The theme of Wild champions is wild animals playing Olympic sports. The animals are a bear, a goat, a giraffe, a snake, an elephant and a monkey. When you win using one of these animals as a winning combination, an animation will play where the animal is playing his sport. The animations are very cute and add to the fun of playing the Wild Champions scratch card. Playing Wild Champions is easy. First, you have to choose your stake (or bet). Bets available on the Wild Champions scratch card are: $0.50, $1, $2, $3, $4, $5, $6, $7, $8, $9 and $10. Once you have set your bet value, you can hit the “New Card” button. Then, you can either click on each of the squares individually or you can hit “Reveal All” to do them all at once. Prizes on Wild Champions are (from highest to lowest): monkey (250X), elephant (50x), snake (10x), giraffe (4x), goat (2x) and bear (1x). The maximum possible win is $2500. Wild Champions is not only an easy online casino game to play, but it’s also fun, humourous and has the inherit value of cuteness as well. Animal lovers will especially enjoy playing the Wild Champions scratch card at 777 Dragon Casino. Can players in the United States play Wild Champions for real money? Microgaming currently does not allow players from the United States of America. However, US players can play the many different online scratch card games at Lucky Red Casino. How do I play Wild Champions? Wild Champions is both fun and easy to play! All you have to do is bet whichever value you please ($0.50, $1, $2, $3, $4, $5, $6, $7, $8, $9 or $10), and then hit “New Card.” From here, you can either click on each square to start scratching or hit “Reveal All” to automatically scratch the entire card. If you get a winning combination, your prize will be paid out and you will view an animation of your symbol playing his sport! What is a good instant win scratch card?